Advance Tabco 1014A-10 (1) Compartment Undermount Sink - 10" x 14"
(1) Compartment Undermount Sink - 10" x 14"
The Advance Tabco 1014A-10 Smart series undermount sink is deep drawn for more strength and does not have seams, so cleaning is simple. 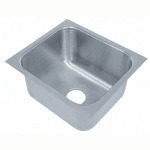 The bowl itself is made from stainless steel for durability and corrosion resistance. Sound deadening pads are included to prevent unnecessary noise. The bowl measures 10 inches long by 14 inches wide by 10 inches deep. The Advance Tabco 1014A-10 Smart series undermount sink features Tabco's Smart Finish™ for a mirror finish that is pleasing to look at.